Elisa Lam was a 21-year-old Canadian student who was found dead in a water tank on the roof of Cecil Hotel in Los Angeles under mysterious and inexplicable circumstances. The security video of her on the day of her disappearance with her entering and leaving the elevator attracted much attention from media and over the internet, and here are more details about it. After two weeks of her disappearance, the police released Cecil’s surveillance video in which she was last sighted exhibiting strange behaviors in the hotel’s elevator. While on a tour of the West Coast, before reaching Los Angeles on January 26, 2013, and checked into Cecil Hotel two days later. Throughout her travels, Lam kept in touch with her family and on January 31, she was scheduled to checkout. When the staff didn’t hear from her they called the police and her family arrived to help search for her. On February 6, they the police posted flyers with her picture and when another week passed without success, they released the hotel footage of her which was taken on February 1. The two and a half minute video of Lam shows her in casual clothes entering the elevator from the left and selecting several floors on the control panel. When the doors didn’t close, she steps forward leaning her head out of the door and looks at the both directions. She then suddenly steps back inside the elevator, backing up to the wall and then to the corner near the control panel while the door still remains open. She is seen to perform other such actions until it finally closes when she walks away to the left. Her strange behavior in the elevator drew worldwide attention and sparked several theories including paranormal activity. The video was widely shared over the internet with 3 million views within ten days in China. Some believe that she was merely playing “Elevator Game” while others think that she might have been possessed during her stay at the hotel. On the other hand, some others believe that she was trying to escape a pursuer and her strange behavior was the expression of her frustration because of the elevator’s malfunctioning. Some say she was under the influence of ecstasy, and when her psychological problems came into light, some suggested that she could be having a psychotic episode. Lam was diagnosed with bipolar disorder and depression, which her family kept secret, and was taking four prescription drugs at the same time. Between 2010 and 2012, she blogged a little about her personal life, including her struggle with the disorder. She wrote that she felt “so utterly directionless and lost” and that the disorder-related course withdrawals would make her transcript look suspicious. She was taking four prescription drugs, but according to her family, she showed no suicidal tendencies. During the autopsy, toxicology results were consistent with blister packs and loose pills of these drugs found in her belongings. There were also traces of nonprescription drugs in her system, especially Sinutab and ibuprofen, but no recreational drugs. Her body, which was discovered by an employee, was floating a foot below the water level in one of the water tanks that provided water for the guest rooms, the kitchen, and the coffee shop downstairs. After the discovery, the police arrived and had firefighters cut the tank after draining it because the opening was too small to get the equipment in to bring the body out. All the guests at the hotel left, with many of them expressing disgust because they have been drinking water with a dead body in it. Though the health department found that the water wasn’t exactly contaminated, a “do not drink” order had been issued and had the all the tanks drained and refilled. The hotel paid for some of the guests to relocate and had those staying sign a waiver that they were aware of the risks. The mystery of how she died was never solved. Though the investigators could conclude that she died of drowning, no explanation for how it happened in the first place could be given. By the time her body was found, it was bloated and somewhat decomposed. The autopsy revealed no physical trauma or sexual assault. She was floating naked with her clothes, watch, and room key alongside her body. 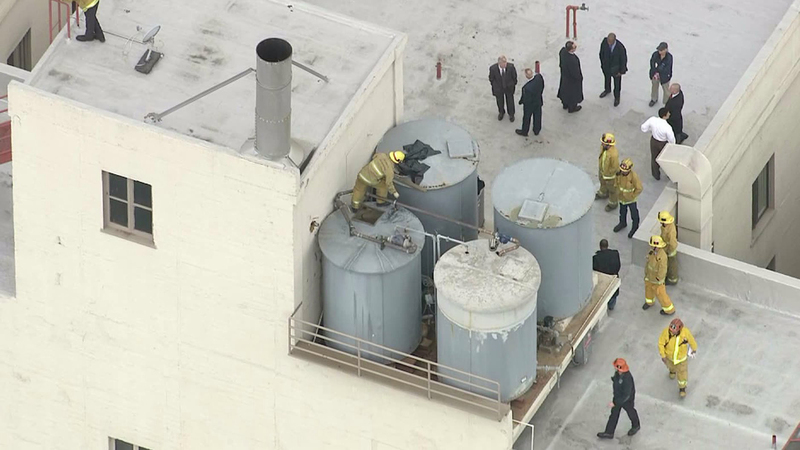 It is a mystery how she was able to get into the water tank as the doors and stairs that led to the roof were locked and using force to open would have triggered the alarm. It could have been possible that she used the fire escape to get to the roof. But the tanks are 4 by 8-foot cylinders mounted on concrete blocks with no way to climb. The tank lids are heavy and are difficult to replace from the inside.